Electric Portable Aerosol Applicator (ULV / Mister) – Dispenses BOTH Oil and Water-based Products. The Hurricane is capable of dispensing disinfectants, deodorizers, germicides and insecticides. It is being used successfully in hospitals, restaurants, warehouses, nursing homes, schools, greenhouses and other institutions. With an adjustable output of 0-5 gallons per hour, this versatile unit gives you the power to handle both large and small area, wherever aerosol particle chemical treatment is needed. 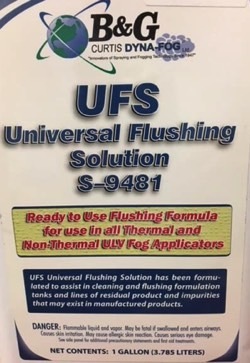 Curtis Dyna Fog Universal Flushing Solution will protect your investment, clean your unit, reduce service issues and ensure proper flow rate and results. Order Now!